Yesterday I had a great day at the Knitting and Stitching Show at the RDS in Dublin. Carmen and I left at 7 o’clock to beat the worst of the traffic and we arrived at the RDS by about 9.30am. Because we were both doing a stint helping and demonstrating on the Feltmakers Ireland stand we were lucky enough to get in free! It was a great day. I had never actually been to any big fibre event before being so new to felting but Carmen had prepared me well!! What surprised me the most was that I did not go too mad buying things, I have a habit of jumping in like there is no tomorrow and I could have ended up with a truck load of bits and bobs that never would have been used had I not restrained myself. The absolute best stands for me to pick up more unusual items were Art Van Go and Twisted Fibres, both had BEAUTIFUL fibres for felting (or any other type of textile art) and I was smitten. It was great to see Stephanie from the Yarn Room in Co. Wicklow absolutely snowed under with customers, I really didn’t get any time to chat to her properly as obviously sales take priority over everything else! So, what did I buy? Pink Pig notebooks to embellish with felt for Christmas presents, handmade paper to make gift tags and cards, 2 beautiful wooden stamps, gorgeous hand dyed silk roving, seed beads, 2 huge buttons, a piece of coarse scrim to felt into a wall hanging, some findings for jewellery making, wire for using with beads and finally some more Pink Pig notebooks! The Feltmakers Ireland stand was totally mobbed for all of the day. If people have never seen felt being made before the attraction is usually instantaneous, many new people joined up and many old friends visited the stand. I was delighted to meet some people local to the South East and I think that all the upcoming courses on the workshop page are going to be totally full before long judging by the interest at the show. It was lovely to met some people who are following my activities on this blog, I hope that you all had a great day in Dublin! I have been making a series of felted beads to incorporate into some new necklaces that I am making for another exhibition that I will be participating in. Yesterday I was contacted by Tunde from KOZO studio and gallery to say that my submission had been successful for the Winter/Christmas exhibition that she is organising so I was very excited. Twelve selected artists have been chose for this well organised event which is running at the KOZO Gallery in Thomastown, Co. Kilkenny from 19th November until 31st January. This means that both this exhibition and ‘Breaking Out’ run at the same time which is brilliant for me, hopefully it will also mean that more people may be interested in learning the fascinating craft of felting! Christmas Craft Swap and Autumn Swap update Everyone should have posted and received their Autumn Swap packages by now, please can you make sure to photograph your goodies and post them to our group pool on Flickr? It is really important that everyone’s effort is aknowledged and it is brilliant seeing how many talented members we make friends with around the world. Our new swap is the Christmas Craft Swap and to make sign ups a simpler process for me to organise and monitor from now on please sign up through Clasheen Crafty Swaps. If you are not a member of Flickr it is really simple to join up (follow the instructions) and you will also be able to express your likes and dislikes in the discussion section of the group. Our swap will consist of either a hand made Christmas ornament OR a handmade Christmas gift, a seasonal receipe and a small little extra. Please say whether you would like an ornament or a gift when signing up to the swap and make sure to sign up before the closing date of Saturday November 15th. Swap partners will be assigned on Sunday 16th and packages need to be posted out by Friday 5th December, this gives everyone 3 weeks to come up with the goodies! Drum carding machine is magic! I finally succumbed to the lure of Carmen’s new drum carding machine! To date I have been more than happy with the variety and quality of commercial fibres on offer but finally I have tried mixing my own and have to confess that I could become hooked!! The carder has been left in my possession for 2 days and I am live a devil possessed, my favourite mixture of fibres is merino and mulberry silk and I am frantically carding as much as possible before I give the machine back. I also carded some of the beautiful Jacobs wool that I got a present of, still not sure that all the work is for me but it will be nice to make something with wool that I have washed, picked over and carded myself. The biggest problem I find is that it is very tough on my back and although I love the idea of preparing all my own fibres it is not really the best option for me. What can I say about the beautiful woven bag that I recieved from Martina in the swap?? Pictures to go up as soon as the weather permits me to take a good image. The colours are perfect for me, a rich russet with black highlights, really beautiful with an organic hemp and cotton outfit I have from Blue Fish in Taos, New Mexico. thanks a million Martina! 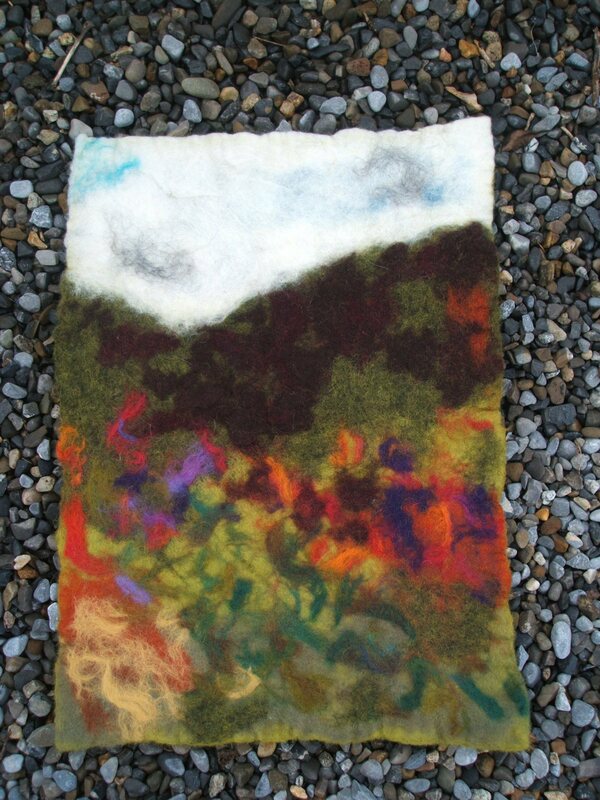 The dates for the 2 felted rug workshops with master Turkish feltmaker Mehmet Girgic have now been set. The first dates are Friday 16th to Sunday 18th January and the second workshop takes place from Tuesday 20th to Thursday 22nd January inclusive. Places are limited to 10 participants per course so if you are interested please contact me as soon as possible. Check out the workshops page for information re costs and venue. Please also note that the 5 week beginners felting course that I am teaching will now start on the first Thursday of November. Apologies for any confusion caused, I forgot that I would be working on the Feltmakers Ireland stand at the Knitting and Stitching show at the RDS next Thurdsday! I ended last night and started this morning by stringing a few more simple but stylish felt necklaces. Some of them were made entirely from felt beads or balls, some were felt and vintage buttons and one was felt with a beautiful hand painted African button as the feature piece. Probably I am putting off starting to tidy my studio but unfortunately (or fortunately as the case may be) I am going to have to get stuck into it in the next half an hour or so. Carmen is arriving just after lunch and I want to do a serious afternoons work, nuno scarves call, so really I need to clear the long table soon if I want to lay the fibres out on it! I also spent some time setting up a new Flickr group called ‘Clasheen Crafty Swaps’ this morning, check it out and if you have been participating in our Autumn Swap please take the time to join Flickr (if you are not already a member) and upload photos of your swap packages. My image of the amazing painting and other goodies I received from Anna is already there, it is really great fun to see what everybody has sent and received, it just adds another dimension to the swap. For friends who would like to join in the discussions that we will have through the group please feel free to join even if you are not intending getting involved in the swaps. I know that not everybody has the time to engage in the swaps, my only request is that members only post images of their current work if they actually do join the varaious swaps and this way I can moniter the group content without too much difficulty. Yesterday I put the last finishing touch to some of the items that I have sent out in the Autumn swap. These necessary but fiddly touches really defeat me sometimes so it was really good to have a deadline to work towards, things like putting poppers on bags and sewing pin backs to brooches, all the little SEWING details! Anyway it inspired me to get out those bowls of felt beads that I have just waiting to be put to use. In the afternoon Carmen arrived and we spent the time happily sewing beads around the edge of a hand dyed silk scarf (Carmen) and stringing several simple but attractive necklaces (me). Today I actually have a couple of things to do outside the house but intend on spending some time tidying out the studio, or at least starting it in preparation for a marathon day tomorrow. I have organised a neighbouring farmer to help me for a couple of days before next Thursday, he has some fiddly but essential outdoor tasks and I have those essential but horrible indoor tidying tasks to complete before the first of my evening classes starts next week. I am also going to be finalising Mehmet Girgic’s workshop dates today so keep your eye on the blog, they will go up as soon as they are organised. By now all of out Autumn swaps should be in the post. I have a small confession to make, I missed the post yesterday so appologies to my partners, they are posted now but you will be getting your parcels one day late and I really have no excuse except confusion and distraction! Next time for the swap I may set up a group on Flickr to run everything through. Things were a bit confusing here and I actually am involved in a couple of swaps (really enjoying them!) but operating through my Flickr account would mean that I would have less chance to miss anyone out or have any errors. My swap package arrived from Anna, thanks SO much Anna for the fantastic painting and the great cards. I actually admired the painting on Anna’s painting blog at the weekend so was absolutely amazed when it arrived in the post yesterday!! I am also looking forward to making the delicious sounding bread, it should tase great made in the Rayburn. Please email me images of your swap packages as they arrive if you want to and I will set up a page on the blog so others can see them as well. Hi everyone, I have just been tagged for the first time and had to do a little bit of research to see what this actually involved! Thanks so much for the tag Joni. Share six (6) non-important things/habits/quirks about yourself. I think that you can share things that you love! Tag at least 3 people at the end of your post and link to their blogs. 1 I am exceptionally messy although people who have never been to my house assume that I am very tidy! I drive poor Alan mad with my messiness!! 5 I absolutely hate when someone puts butter in the marmalade or marmalade on the butter – please use a butter knife and a jam spoon! 6 My studio is so untidy that all I ever seem to do is move things around, where oh where do I start to get it in order?? The people that I would like to tag are Cathy, Holly, Anna and Micky. I hope that you all accept the challenge! Here is an image of the landscape that I made yesterday, it was inspired by the mountains around Clasheen and measures 35cm X 49cm.